LILLINGTON, NC – The Clayton Bootleggers’ 2018/2019 season ended this past Saturday with a disappointing 67-38 playoff loss to Cape Fear. After finishing in second place of the Carolinas D3 Division, Clayton earned the first home playoff birth in club history. The home field advantage was unfortunately was negated as severe weather during the week forced the club to shift their playoff match to Campbell University. Some fine work by Clayton RFC Board Members to prepare the pitch at Campbell saved the match from being cancelled. Cape Fear made their intentions known right from the opening kickoff as they used their forwards to grind their way down the pitch. They rammed in the first score of the match in the 3rd minute and followed with another converted try in the 10th minute to take an early 14-0 lead. Fear added another in the 20th minute to take a demanding 19-0 lead midway through the first half. The Bootleggers got on the scoreboard in the 24th minute when No. 8 Gareth Davies crashed over for a score. The conversion by Ed Dixon left the score at 19-7 as Clayton hoped to chip away at the Cape Fear lead. That, however, didn’t come to pass as multiple mistakes led to three tries in the ensuing eight minutes as Cape Fear extended their lead to 38-7. 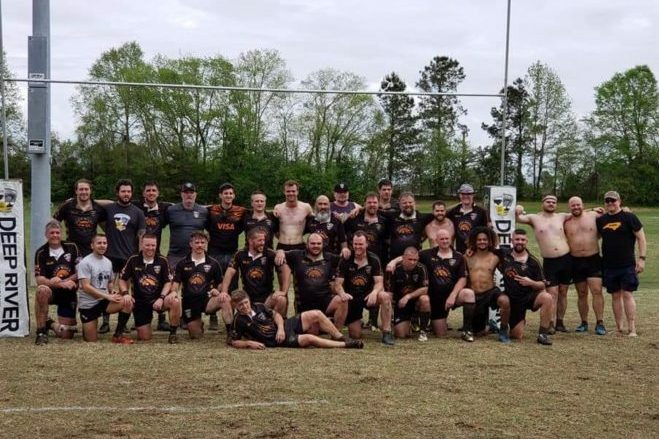 Desperate for a score before halftime, the Bootleggers got a long range score from outside center Austin Lyons in the 39th minute followed by a long interception try by flanker Eric Davis with time expired on the half as Clayton went into the break down 38-19. The home side came out in the second half determined to cut into the Cape Fear lead. The Bootleggers were first to score in the second half as Lyons added his second try of the match in the 46th minute. The conversion from Dixon cut the Cape Fear lead to 38-26. Clayton then took the kickoff and pushed deep into Fear territory and appeared poised to turn the match into a one-score game. A fine goal line stand from Cape Fear turned the Bootleggers away and forced a turnover. Cape Fear then went the length of the pitch to score a crushing 48th minute try and extend their lead to 44-26. The Bootleggers answered right back with a try from Cam Grim in the 50th minute to cut the deficit to 44-33 with 30 minutes left to play. A yellow card to Clayton’s Simon Potter in the 53rd minute opened the door for Cape Fear as the visitors scored two converted tries to extend their lead to 58-33 as the match entered the final quarter of play. Cape Fear added two more tries to secure the match before Davies added his second try of the match for the Bootleggers at the death. The loss ended the Bootleggers 1st XV playoff run and the season. The club’s 1st XV finished the season with a overall record of 9-4. The playoff match then made way for a friendly between Campbell University and the Clayton 2nd XV. The match was an entertaining affair as both clubs traded early scores before the Bootleggers started to build a lead aided by two tries from Tim Torres and tries from Jim Bartles, Paul Castellana, and Jonathan Diaz. It was a tale of two halves though as the younger and fitter Campbell side took control of the match in the second half. The Bootleggers’ lone try in the second half came from Eric Hile as the 2ns XV ultimately fell to Campbell by a score of 48-36. The Clayton RFC 2nd XV ended their season with an overall record of 3-6. With the season finished, the Bootleggers now set their eyes on the summer 7s season. 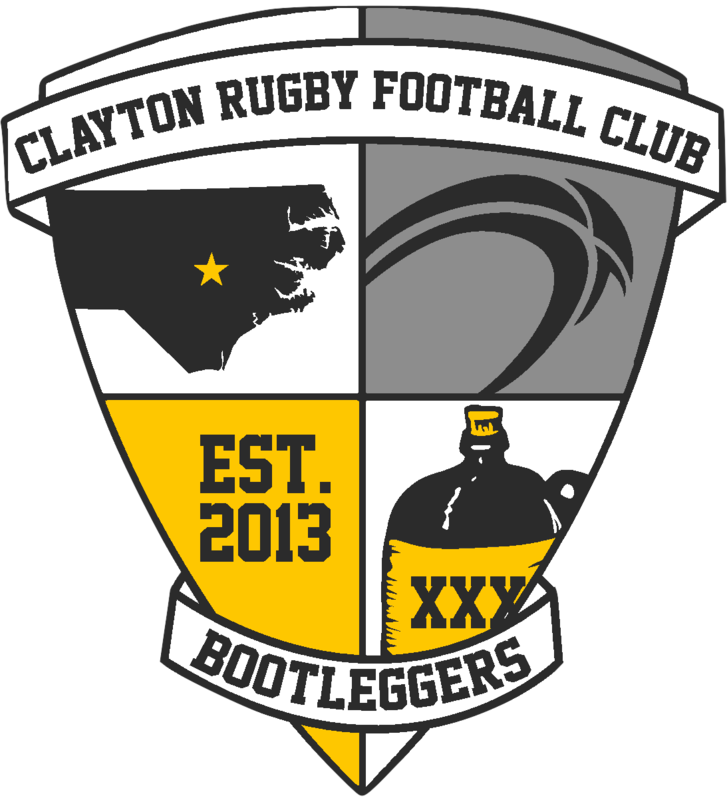 The Bootleggers will begin 7s practices in mid-May with plans to participate in 4-5 tournaments over the course of the summer. New players are encouraged to get involved at any time. The summer is an excellent time to get some experience before the club begins pre-season practice for the 2019/2020 season in mid-August. Next up on the Clayton RFC social calendar is the 2nd Annual Bourbon, BBQ, and Bluegrass event on Sunday April 28th at Revival 1869. Next up on the rugby calendar is the 4th Annual CottonTown 7s Rugby Festival on July 13th.